Scouting is fun at every turn! The goal is to raise boys who respect themselves, respect others and who have strong character. There is no better youth leadership or community service training than Scouting. Cub Scout Pack 102 is in Camp Butler, Okinawa and we are dedicated to providing a fun Cub Scouting experience for all boys from Kindergarten through 5th grade. Cub Scout Pack 102 runs a year-round program uniquely designed to meet the needs of young boys and their parents. Our program offers fun and challenging activities that promote character development and physical fitness. Service projects, ceremonies, games, and other activities guide boys through the core values and give them a sense of personal achievement. Through positive peer group interaction and parental guidance, boys also learn honesty, bravery, and respect. 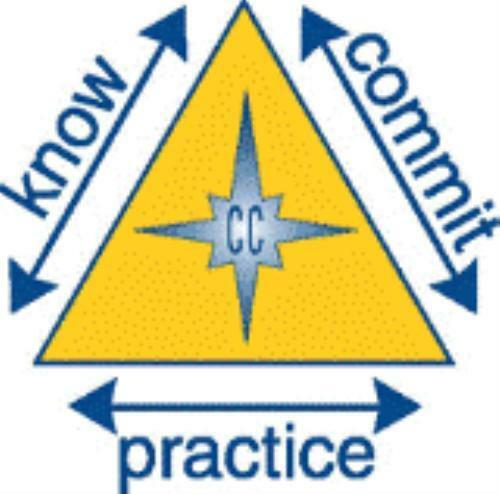 Family involvement is an essential part of Pack 102's Cub Scouting program, and parents are required to play an active role in our Pack as Leaders, Committee Members or Event Helpers. Through interaction between parents, leaders and friends, boys learn citizenship, compassion, and courage. This family and community centered approach to learning means that Cub Scouting is truly time well spent for your sons! 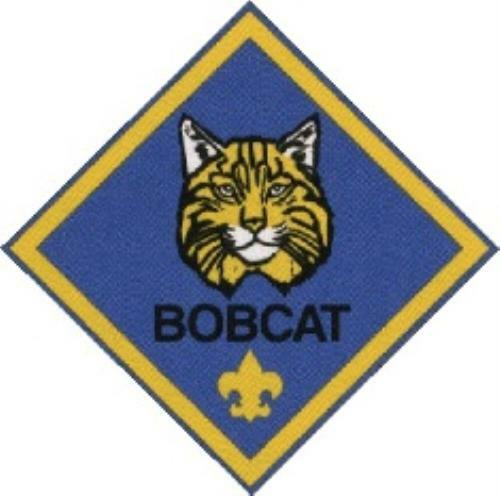 Each boy who joins the Cub Scouts will first earn the Bobcat badge. The boy must do his best to learn seven items, including the Cub Scout motto, the Scout Oath and the Scout Law just to name a few. The Parents must read and discuss with the boy a pamphlet on preventing child abuse. 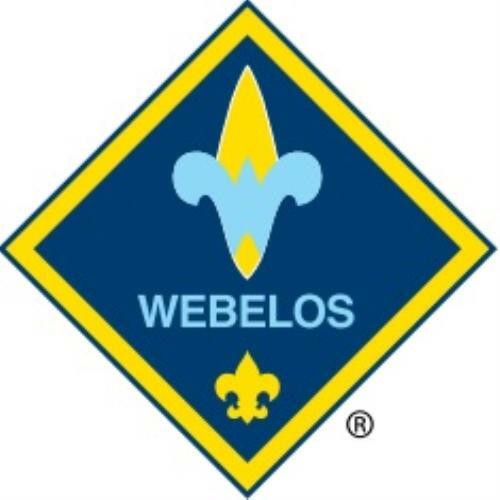 The pamphlet can be found in the front of each Cub Scout handbook. When the boy has completed each step to the best of his ability, the parent can sign it and provide it to the Den Leader for review. 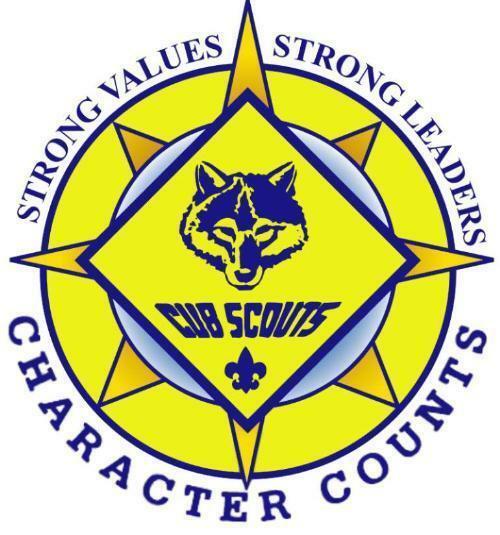 The scout will receive his badge at the next Awards Ceremony during one of our Pack Meetings. 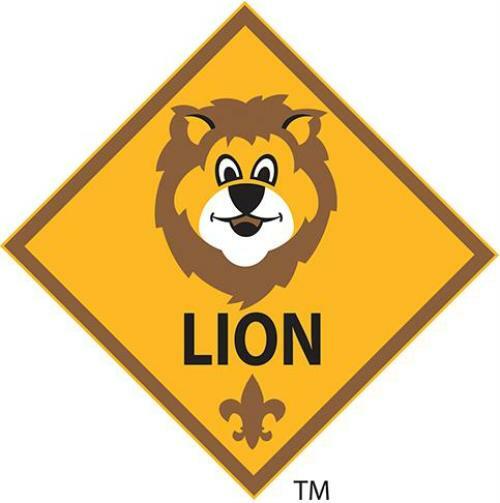 To earn the Tiger badge, a boy must complete six required adventures with his den or family and one elective adventure of his den or family’s choosing. As the boy completes each adventure, he will receive the adventure loop for that adventure, which he can wear on his belt. When the boy has completed the seven required adventures, he can receive the Tiger badge. 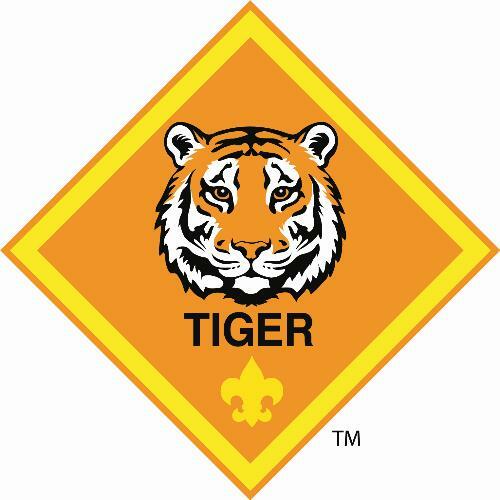 The Tiger badge is given to the boy’s adult partner at a pack meeting. Then, during a grand ceremony, the adult gives the badge to the boy. 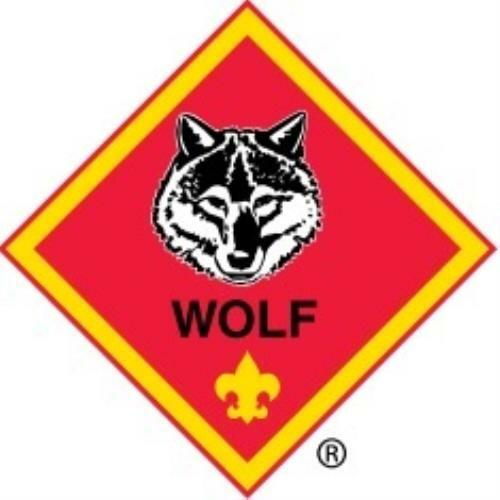 To earn the Wolf badge, a boy must complete six required adventures and one elective adventure. His parent or guardian and den leader approves each requirement by signing his book, and the boy receives an adventure loop for each adventure. When the boy has met all requirements, the Wolf badge is presented to his parent or guardian at the next pack meeting. During an impressive ceremony, the parent or guardian then presents the badge to the boy. 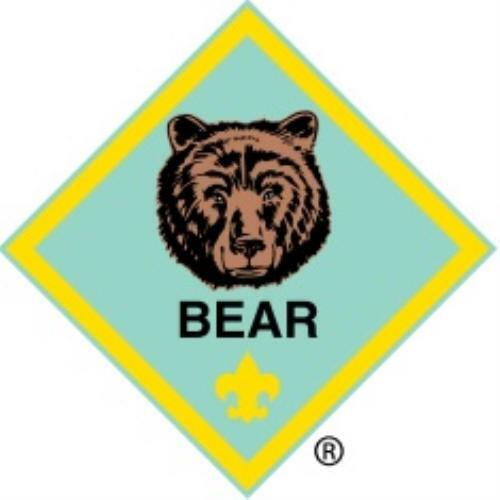 To earn the Bear badge, a boy must complete six required adventures and one elective adventure. His parent or guardian and den leader approves each requirement by signing his book, and the boy receives an adventure loop for each adventure. When the boy has met all requirements, the Bear badge is presented to his parent or guardian at the next pack meeting. During an impressive ceremony, the parent or guardian then presents the badge to the boy. 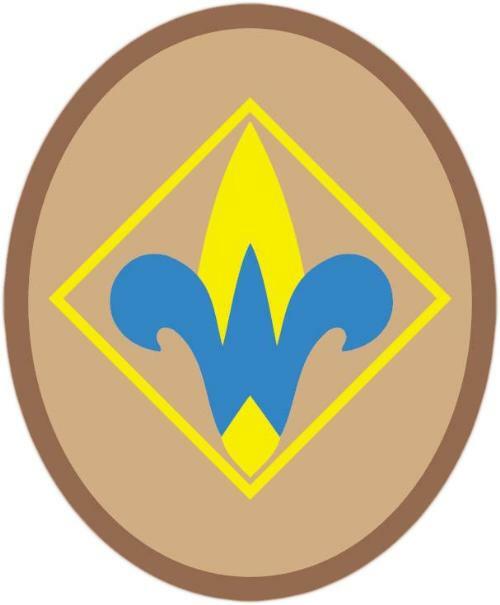 The two extended fingers stand for the parts of the Scout Oath, "to help other people at all times" and "to obey the Scout Law". They also stand for the two alert ears of a wolf. 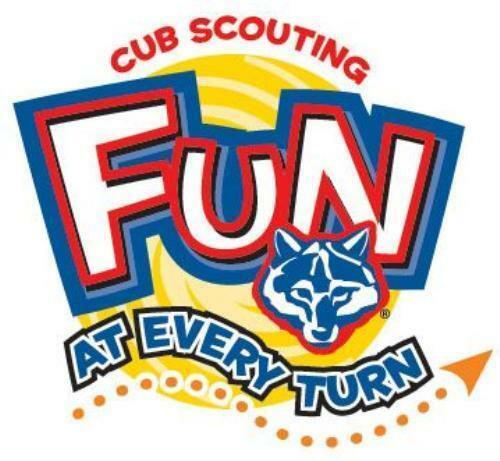 This is the sign of Cub Scouts all over the world. 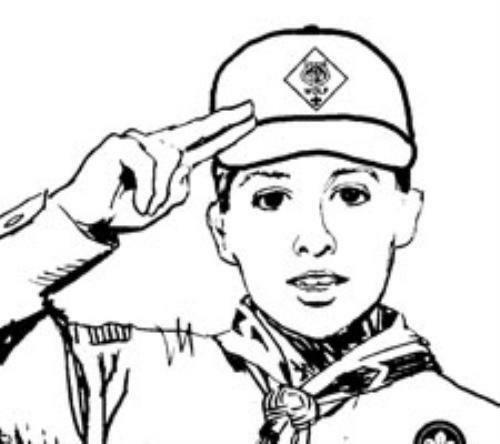 The Cub Scout sign should be given when repeating the Scout Oath or Scout Law. It is also used in ceremonies to let everybody including parents, siblings and guests know to quite down and pay attention. Here's how to shake hands with another Cub Scout. Hold out your right hand just as you always do to shake hands. Put your first two fingers along the inside of the other boy's wrist. Cub Scouts and Cub Scout leaders use the handshake each and every time they shake hands. The handshake signifies that those who use it help other people and the obey the Scout Law. 1. Citizenship: Contributing service and showing responsibility to local, state, and national communities. 7. Honesty: Telling the truth and being worthy of trust. 2. Compassion: Being kind and considerate, and showing concern for the well-being of others. 8. Perseverance: Sticking with something and not giving up, even if it is difficult. 3. Cooperation: Being helpful and working together with others toward a common goal. 9. Positive Attitude: Being cheerful and setting our minds to look for and find the best in all situations. 4. Courage: Being brave and doing what is right regardless of our fears, the difficulties, or the consequences. 10. Resourcefulness: Using human and other resources to their fullest. 5. Faith: Having inner strength and confidence based on our trust in God. 11. Respect: Showing regard for the worth of something or someone. 6. Health and Fitness: Being personally commited to keeping our minds and bodies clean and fit. 12.